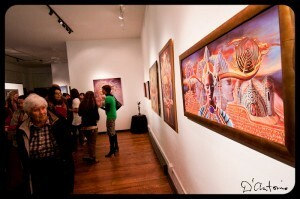 Martina Hoffmann - ARTE AMAZONIA provides a global voice through art for the indigenous cultures of the Amazon. 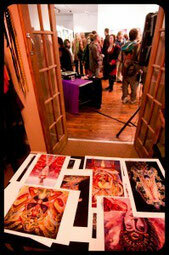 exhibited at Knew Conscious Gallery in Denver, CO. USA. German-born artist, Martina Hoffmann, spent her childhood in Germany as well as Cameroon, West Africa, where she was raised bi-lingually in French and German, while surrounded by African, French and German culture. Here she lived as a white minority in black Africa, one of her more valuable life experiences. Upon returning to Europe with her family she finished her formal education in Germany majoring in art with professor Kiefer (father of Anselm Kiefer) while studying sculpting and French at the Johann Wolfgang Goethe University in Frankfurt, Germany. As the need to travel and experiencing new places is an innate part of her nature, Martina moved to Paris, living there until the flow of events brought her to Cadaques, Spain (home of Salvador Dali). While discovering this romantic, beautiful bay on the Mediterranean coast she met visionary artist, Robert Venosa, and, inspired by his work, took up painting. Living the life of an artist proved to be more exciting and educational than academics, so Hoffmann decided to permanently move to Spain and embarque on the inspirational journey of being an artist full time. Upon arrival in Cadaques she moved into Venosa's studio. As both shared the fascination for travel they soon embarked on a series of trips to Venosa's homeland, the United States, and, after several journeys back and forth, they eventually decided to set up studios in both Colorado, and Cadaques. There, in the early 90's Hoffmann joined a group of women artists and activists who presented their ideas and concerns in multi- media stage shows under the name of 'Vox Femina'. For those shows Martina created live sculpture on stage, videos, as well as her own multi-media performance pieces. During this time she also taught sculpting to children and disabled adults. 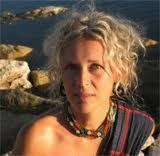 As a painter and sculptor, Martina Hoffmann, intersperses her life of creating art with giving painting technique workshops with Venosa at such institutes as The Skyros Institute on the island of Skyros in Greece, Esalen Institute in Big Sur, California and the CIIS (California Institute of Integral Studies), as well as private workshops in Boulder, Colorado and on the Big Island in Hawaii. Together Hoffmann and Venosa have designed numerous CD covers, amongst them Kitaro's 'Mandala' for which Hoffmann did the photography. Also, Martina has designed and created original art for book covers. Her early paintings were influenced by her interest in how much of the human persona is reflected in the face, so portraiture, in particular of women, became her first main subject matter. Later she explored women’s creative and procreative nature in a series of paintings and sculptures of pregnant nudes. She calls these life-size images 'Birthscapes'. They are full-body portraits describing the physical and spiritual realities of pregnancy. In her latest work Hoffmann uses her inner visions as a guide and the inspiration for her paintings. She primarily sees herself as a 'translator' for these visions. Having started out with a more traditional approach Hoffmann's work has evolved into a Magical Realism all of her own, although she still enjoys using realistic elements in her visionary paintings. Martina is also a Reiki-master, studies western herbalism and is continuously trying to broaden her understanding of how the universal energy moves in, through and around us. 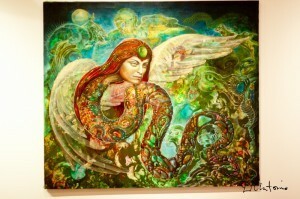 Martina Hoffmann's work has been exhibited internationally as well as being published in books, calendars and magazines such as Illuminatus, Drinking Lightning, Craftsman House, One Source, Sacred Journeys, Markowitz Publishers, The Return Of The Great Goddess, Shambhala Publishing, Celebrating Women's Spirituality, The Crossing Press, Magical Blend, Expose and Nexus.